This is my original crew. 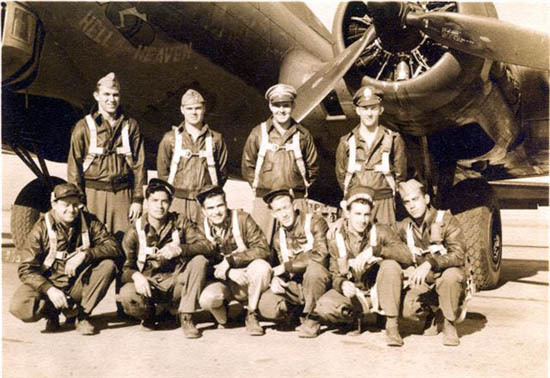 All with the exception of one ( second from right, bottom row ) were 32nd squadron members. Photo was taken just before we shipped to Casablanca, Africa. November 1943 ? Back row starting from the left. William Epps, Pilot, Lyman Whitney, co-pilot, Robert Sullivan, Navigator, Tompkins, Bombardier Do not remember his first name as I lost my crew list. Bottom row starting from the left. 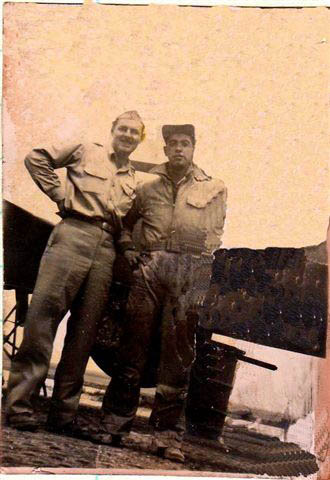 John Wheeler, Engineer, Alfoso Chavez, Waist gunner, Robert ? Radioman, Thomas Wages, Waist gunner, Herb Lewis, Tail Gunner, was taken ill just before we shipped out. Joseph Mangano, Armament. Was to be a waist gunner but I volunteered to be a ball turret gunner and as a result flew with random crews as there was a need for ball turret gunners. Flew my first mission January 17, 1944 and completed my 50th credits ( 37 actual sorties ) May 12 1944. Epps and I met several times after the war. He died at age 48 from a heart ailment. I corresponded with Whitney until he died several years ago. I have not been able to locate Sullivan ( photo of he and I on landing after my lst mission to follow ) or Robert Wheeler and I kept in touch and had a few visits. Passed away several years ago. Talked to Chavez several times by phone. Did have a visit from Wages a few years ago. He died shortly after a visit. Doug Moore, the pilot on our March 22, 1944 Verona mission and ditching, call each other every March 22 and give thanks for having been spared. I made it to 84 last month (April) and do give thanks and pray for all the others who gave their all. Sullivan met me at the plane on my last mission. 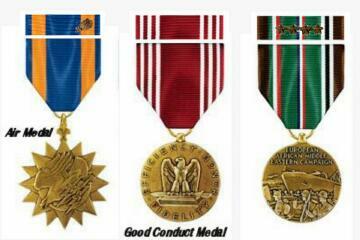 On leave at home after my missions and by coincidence my cousin was on leave having completed his 25 with the 8th. 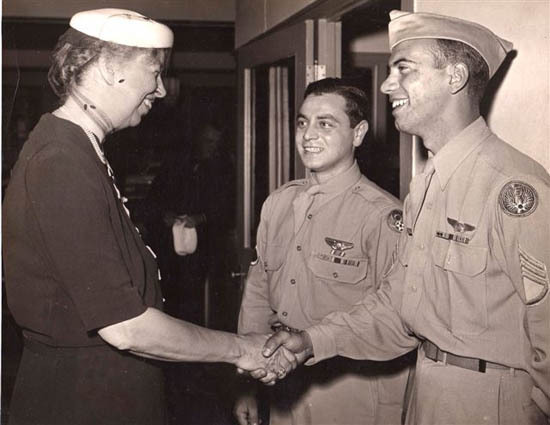 As I had a Presidential Unit Citation the PR asked us to meet with Mrs. Roosevelt at a USO. Military Occupational Specialty (MOS): Ball Turret gunner.